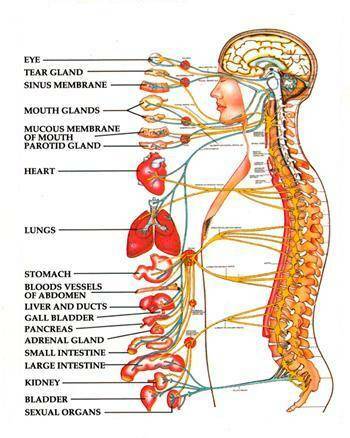 The nervous system is the primary control system in the body. It is divided into the central nervous system and the peripheral nervous system. The spinal nerves are parts of the peripheral nervous system. They receive inputs from the different sensory organs in the body and deliver the information to the central nervous system for processing. The human body has 31 spinal nerves, each corresponding to the segments in the vertebral column: 8 cervical, 12 thoracic, 5 lumbar, 5 sacral, and one coccygeal nerve. For easier naming, anatomists use a letter and a number to represent the nerves. The letter represents the region of the vertebral column where the nerve emerges, while the number corresponds to the origin. For example, the cervical nerves have the designation C1 to C8, the thoracic T1 to T12; lumbar L1 to L5 and the sacral nerves S1 to S5; and for the coccyceal nerve, anatomists use the designation C0 to avoid confusion with the cervical nerves. When you analyze the anatomy of the spinal nerves, they come from the combination of the dorsal and ventral roots of the spinal cord. The dorsal roots represent the afferent sensory axons, which receives information; whereas the ventral roots represent the efferent sensory axon that will carry out the appropriate response. Most of the spinal nerves arise from the spaces in between the vertebrae, known as the intervertebral foramen. However, the uppermost pairs pass through the occipital and the atlas bone, and the last nerve passes through the intervertebral canal in the coccyx. When the spinal nerve leaves the intervertebral canal, it will branch out into two parts, which are the posterior primary ramus and the anterior primary ramus. Both of them contain the motor and the sensory nerve fibers. The posterior primary ramus supplies the muscles and the skin at the back, whereas the anterior primary ramus supports the frontal part of the body. When any of the nerves supplying the muscles experience injury, you will observe a loss of power in the supplied area, although the sensation is still present. The spinal nerves cause the innervations in different parts of the body. Let's say, for the cervical nerves, they supply the muscles and skin of the neck and the shoulder. If you experience pain in the area, you must consider a problem in your cervical nerves. The thoracic nerves branch out to supply the internal organs and the muscles of the middle back. Most of the large muscles at the back and in the lower extremities attach to the lumbar nerves. Sacral nerves, on the other hand, are responsible for some parts of the hips, thighs and legs. By simply knowing the spinal nerve supplying one area, you have the knowledge on the nerve that is responsible for causing the discomfort. Physicians use the concepts on spinal nerve anatomy and physiology in giving medications, starting a treatment or performing surgical procedures. Your nervous system will never work without the spinal nerves. Because of their importance in the body, any injury with them can cause debilitating problems.